The Ottoman Empire – the last Islamic Caliphate prior to the current one claimed by ISIS leader Abu Bakr al Baghdadi – was established at the end of the thirteenth century, and was not dissolved until the early 1920’s. In Islam, it is obligatory for muslims to obey sharia (Islamic Law). The only legal definition of “jihad” in sharia is “warfare to establish the religion” and, therefore, cannot be evaded when the requirements of the law call for it. Mehmed V was simply stating what all muslims should have known, and the fatwa also makes clear muslims who die in battle are sure to be martyrs and go to paradise. Nothing new today – just a lot more muslims abiding by the sharia. Mehmed V, the 35th and penultimate Sultan of the Ottoman Empire reigned as the Caliph of Islam from 1909 to 1918 whereupon he was succeeded by his half-brother, Mehmed VI, the 36th and last Sultan of the Ottoman Empire, who reigned as the Caliph of Islam until 1922; when the Ottoman Sultanate ceased to exist (though the Caliphate survived until 1924). Therefore, since Ibrahim Awad Ibrahim al-Badri, alias Abu Bakr al Baghdadi of ISIS, wasn’t born until 1971, and has a twenty-five million dollar price on his head, his high-profile claim to the global Islamic Movement’s ultimate-power position of Caliph is preposterous; furthermore, inasmuch as the President of Turkey is reported to have announced a fervent hope to become the next Caliph of Islam, Badri, alias Baghdadi, would be well advised to either start spending most of his time in a subterranean basement, or solve the enigma Josif Dzhugashvili aka “Stalin” rhetorically posed upon learning that Il Papa aka the Pope, planned to bring freedom to Poland, I.e. “how many tank divisions does the Pope Have?”. 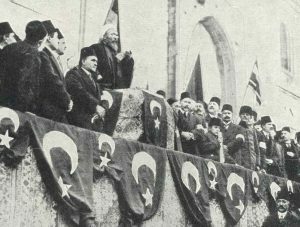 The declaration of jihad against allied forces in WW-!, issued by Mehmed V on 14 November 1914 (who was personally alleged to have looked with disdain on the Ottoman Empire’s pro-German policy) was the last genuine fatwa ever issued by a Caliph of Islam. The Free World must unite to destroy both Islam and Red China. Both are evil entities which threaten the existence of the Free World. Amen.